Well, this is my first post on the new site (which aside from the URL shift should hopefully look the same as the old) and what better celebratory food than an age old classic dessert and snack, the ice cream sandwich. This one was made using chocolate brownie cookies and mint chocolate chip ice cream. I have to admit that once again I’m posting about a delicious treat that my darling wife S made for me, instead of something that I cooked up on my own. Quite simply, she’s not only the better cook but she’s also able to spend more time than me in the kitchen these days. Which means, while I’d love to put on my apron, sharpen my knives, and pour through our 270+ cookbooks in search of something to prepare, most often (especially on the weekdays) I’m simply the happy recipient of some wonderful kitchen magic that S has pulled off during the day. S knows that I love mint chocolate chip ice cream. I used to live off the Breyer’s version when I was in college. Over the years, we’ve tried making it many times, using both mint syrup as well as fresh mint. None have worked well. Recently though, one of our local Japanese supermarkets (Isetan) had a Hokkaido fair—the Japanese supermarkets here have a tendency to host regular Prefecture-centered fairs. At the fair, we picked up some beautiful peppermint oil, which, once we tasted, knew it was the secret ingredient we had been missing. From Alice Medrich’s wonderful book Bittersweet, we also learnt the best way to make chocolate chunks for use in ice cream. If you just use normal chips or chunks, the chocolate is often too hard and tasteless. By melting it first and then refreezing it, the chunks develop a melt-in-your-mouth feel that is perfect for frozen confections. Combine the cream, milk, sugar and salt in a saucepan and bring to a simmer over medium heat. In another bowl, whisk the egg yolks just to combine them. Add the hot cream in a think stream, whisking constantly. Place mixture in a double boiler and cook, stirring constantly until the mixture thickens slightly and coats the back of a wooden spoon (temperature should read between 175º and 180º Fahrenheit). Strain mixture into a clean bowl, stir in peppermint oil and pure vanilla essence, cool and refrigerate, covered, overnight. Freeze according to the instructions for your ice cream maker. Add the chocolate chunks at the end. Melt the chocolate in a double boiler. Pour onto a piece of parchment paper, slide onto a small baking sheet and freeze until firm. Chop the chocolate into whatever size chunks you desire. Return the chunks to the freezer until needed. Preheat the oven to 375ºF/190ºC. Line 2 baking sheets with parchment paper. In a small bowl, whisk together the flour, baking powder, and salt. Set aside. In the bowl of an electric mixer, briefly whip the eggs to break them up. Add the sugar, espresso, and vanilla and beat on high for 15 minutes, until thick. While the eggs are whipping, place the butter in the top layer of a double boiler, or in a metal bowl suspended over a pot of simmering water, and scatter the chocolate on top. Heat until the butter and chocolate melt. Remove from over the water and stir the chocolate and butter until smooth. Gently fold the chocolate mixture into the egg mixture until partially combined (there should still be some streaks). Add the flour mixture to the batter and carefully fold it in. If the batter is very runny, let it rest until it thickens slightly, about 5 minutes. Drop the batter by heaping teaspoonfuls onto the prepared baking sheets and bake until puffed and cracked, 8 to 9 minutes. Cool on a wire rack before removing from the sheets. Congrats on the move to a new url! I have to get mine set up soon, now that I’ve purchased a new domain and hosting service some 1.5 months ago. Now I understand why the ice cream sandwich is served on yoshimoto nara plates 🙂 Looks delicious. Oh dear… I really must get an ice cream maker soon… any model/brand u recommend? i am not a fan of “chunks” in ice cream, especially chocolate, but perhaps it’s because of the quality of chocolate and poor “mouth feel”–i will have to try your trick soon. i love the photo, btw–the ice cream sandwich is complemented by the angry nara girl nicely. saffron & santos: Great to see that there are other Yoshimoto Nara fans out there. He’s one of my fave young Japanese artists. saffron: Good luck with your own URL move. Hope it’s soon. spots: We use a Musso Mini Model 4080 (available from Sebastian Muthu, his website is http://www.bats.sg/). It’s the smaller of the three Mussos he brings in. It’s great because it freezes while it churns. It is very, very expensive though, running around S$1000. I suggest buying one of the really cheap ones first, from Tangs or Robinsons, and then if you really get into it, investing in a Musso or a Simac. J: S says Merci Buckets! Santos: Thanks. Thanks to fellow bloggers like Michele over at Oswego Tea (who provided lots of tips), it was an easy move. Wow, I don’t know how it tastes, but the photo is so nice! Congrats on the new home! Michele is rather fab, isn’t she? My own move has been smooth enough, but now blogger isn’t agreeing with me. Regarding the ice cream, how funny, S and I were discussing the merits of mint chocolate chip ice cream this very weekend. It was our favourite when we were little, and I’m sure our adult palates would welcome your creation! 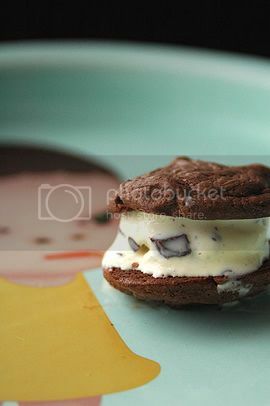 What a wonderful recipe for a summer dessert…ice cream sandwiches never looked so good! i have just had more time to look through your blog in more detail and i am absolutely BLOWN AWAY. Are you a a) a professional food photographer? b) how many cook books did you say you have? i would love to know which are your favourites (i’m just about to blow a huge Borders book voucher i got on cookbooks!) c) it seems like you almost cook for a living! do you? you have a fantastic food site. Do keep it up! Chin Ru: I both shoot professionally and write freelance occasionally but not that often these days. Currently, I’m a paper-pushing civil servant. We have, I think, 290plus cookbooks at last count. Nope, not a professional chef–those guys work way too hard. Thanks. hi, i really nt to try this recipe coz my bf loves mint too ;), but i have a hard time looking for peppermint oil, i’m wondering if tee’s any best substitute for this. i’m thinking if its possible to melt mint chocolate bars wth te custard base for it to be chocmint =P.? thnks in advance.